One of the biggest challenges organizations have when implementing CRM is CRM adoption within the business. This free e-book from Eligeo focuses on 15 different strategies that can be implemented into your CRM starting today. Many of these products have a lot of features, but focusing on the right ones will help you succeed. 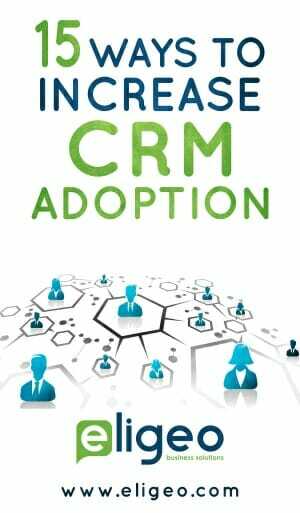 Are you struggling with CRM adoption in your organization? These proven CRM adoption strategies are easy and quick ways to help address systemic issues when it comes to a failed CRM implementation. These are some of the strategies that the CRM experts at Eligeo Business Solutions use within their own organization. This nearly 20-page e-book is a light and easy read that can help you come up with ideas.